Escape the Volcano will be hitting Smashwords tomorrow. This ebook has been a family affair. I wrote it, Benj scanned the out of print dead-tree version which I updated, and Caiti has done me a fantastic new cover, as you can see here. It’s the first in the Escape series that did very well for me back in Ireland, despite little marketing and pushing by the publishers. The two main characters are eleven year old Tom Donoghue and his irrepressible friend, Kevin, one of life’s optimists and jokers. Tom’s Mum and little sister Anna play significant roles, and so does Alan, who they meet up with in this first adventure. (Tom’s dad is a no-show in the stories. I had to kill him off a few years previously since I needed an incomplete family for the series! It’s very hard to write interesting stories about perfect, happy families – sad but true.) This little crowd turned out to be great fun to write about and I enjoyed creating various adventures for them. They go on to encounter avalanches, floods and twisters in the next books. It’ll be free on Smashwords, but you’ll have to pay for the rest of the stories in the series, probably 99 cents each, which I think is a fair deal. So, please do check my Smashwords page out in the next day or two and get yourelf a free copy to enjoy. And let me know what you think of it. Posted in Ebooks, Fiction, Smashwords. 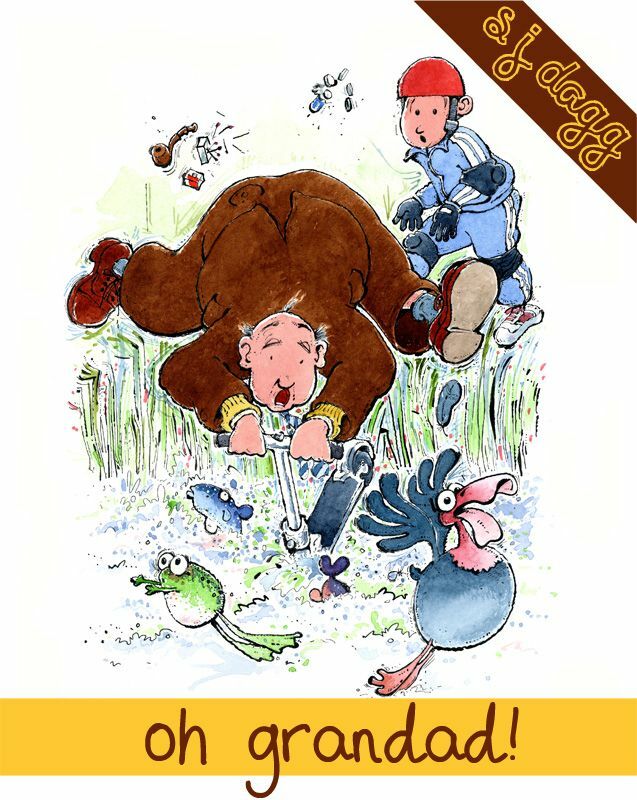 I now have the fantastic cover for Heads Above Water, my account of our first two years in France, attempting to make a living from running a gite and carp fishery. I think it’s awesome. 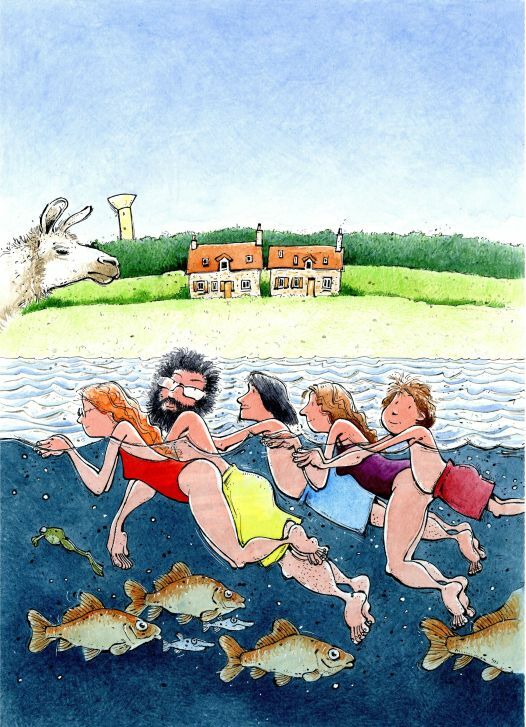 We’re instantly recognisable from Roger Fereday’s cartoon, and he’s captured the key features of Les Fragnes – the lake, the cottages, a token llama, some representative carp and the distant water tower that distinguishes the scenery near here. Daughter Caiti will be adding the typography (in the sky) next time she’s back from lycée. I have a marketing campaing of sorts sketched out – marketing isn’t my strong point, but I’m learning fast. One final read through, and then I’m ready to hit the world with this ebook. The question is, is the world ready? Time for some decluttering and in particular time to get rid of some old books. Now that I’m going in an electronic and self-publishing direction, quite a lot of tomes on my shelves are well outdated now. This is the first to go. I’ve had this book fifteen years. It’s aimed at the publishing scene two decades ago and has very little, if any, relevance any more. At least it’ll make a good few briquettes to keep us warm this winter. That’s the most use I’ll have got from it! It was a bad buy. We all make them. I was sucked in by the 1001 aspect, thinking surely to goodness there’ll be something there that will help me shift a few more books. 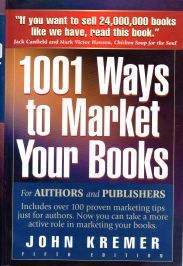 I wasn’t self-publishing at the time, but the publisher I did have wasn’t over enthusiastic in the marketing department so I wanted to see what I could do from my end. Some of the techniques in the book smack of desperation. For example, there were the suggestions of selling your books door to door, sponsoring an award, organise a sweepstake, creating your own speakers bureau, sponsoring a library, putting up public posters (especially in New York!). Many were neither practical nor affordable. Live and learn. I shall replace it with a ebook aimed at today’s publishing scene. I have my eye on Sell More Books. John Kremer is co-authoring again, but he seems to be rather more up to date this time round. If I go for this one, than as usual, I’ll buy on Smashwords for 9.99 dollars and transfer to my Kindle myself. I’m not paying an extra 3.80 dollars unnecessarily to greedy Amazon! Well, Oh Grandad! 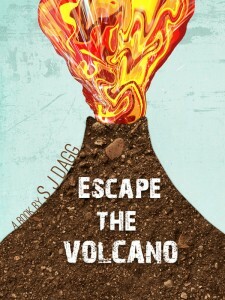 is up on Smashwords now.That’s my fourth book there. As I wrote the other day, I’ve finally got to grips with how to format files for submitting to Smashwords’ meatgrinder for conversion into the various ebook formats. 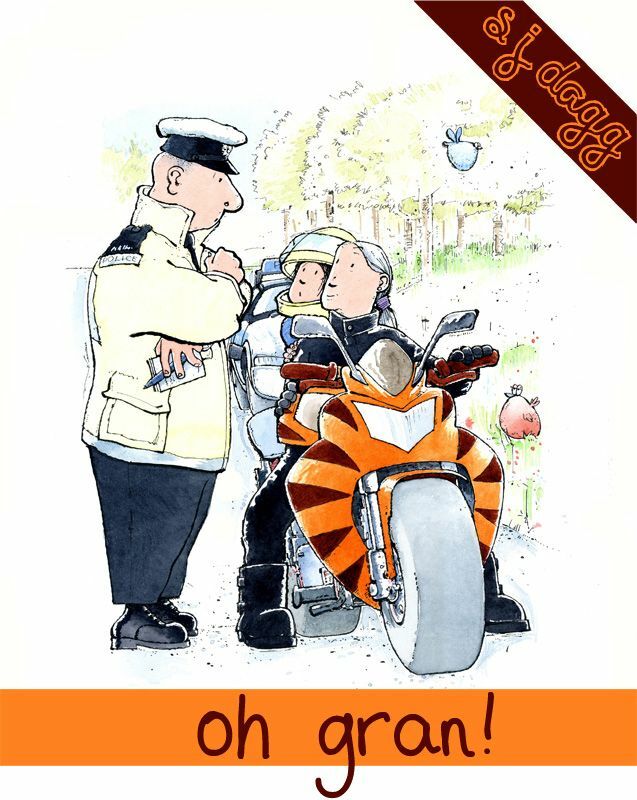 The confirmation came today – Oh Gran, Beat the Hackers and Oh Auntie have all achieved Premium Status which means they’ll be accepted by Apple and Barnes and Noble, who are rather picky about the quality of the formatted texts they’ll take. Let’s hope I’ll see sales soar once my books hit their ebook stores. Ever the optimist! I published Oh Auntie and Beat the Hackers directly to Kindle myself, but with the other two, I’ve opted to allow Smashwords to distribute them to Amazon for me. The advantage of doing this is that I save a little bit of work (although it wasn’t too tricky to upload the books) and that I’ll get paid my royalties via Smashwords. This is good because Smashwords pay via Paypal whereas Amazon will only pay overseas authors like me with a cheque, which isn’t at all convenient. Do check out my Smashwords page and try one or all of my books! Yoohoo! I’ve finally got the hang of Smashwords. I uploaded Oh Auntie! at the end of July, but it had some Autovetter errors that I couldn’t seem to sort out, and then life got in the way. But today I sat down at the computer with Mark Coker’s Smashwords Style Guide beside me on my Kindle, and worked through it all step by step using Oh Gran! as the trial this time. It all made sense this time, and my MS went through the meatgrinder and came out with no errors. That was a real accomplishment. So now Oh Gran! is here. And it’s free. 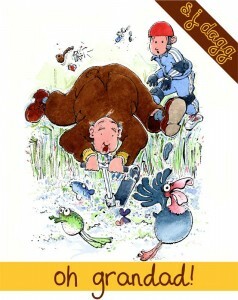 Full of confidence, I tackled Oh Auntie! again and soon knocked her into shape! Here’s the link for that book which costs 99 cents. And I also got to grips with Beat the Hackers which I’ve uploaded to Kindle but was too intimidated to try and get through the meatgrinder. However, I rolled up my sleeves, and through it went, again with no errors. This is 99 cents too and you’ll find it here. My tips, for what they’re worth: I followed Mark’s advice to paste the original word file into Notepad, which strips away all the formatting, and then repaste it into a new Word file. I followed the instructions on paragraph formatting to the letter, and this time put my chapter headings a ‘heading 1’ format. I used Times New Roman 11 point for the text, and 14 point for headings. And I even put in hyperlinks which work! I am a complete techno dodo so I am SO PROUD of myself at the moment! We were having tea – me, my half-brother Orly and Granny Paradise, my step-grandmother. Does that sound complicated? Sorry, but the complicating factor is my mother. She is a walking disaster zone, as you’ll see. We were waiting for mum to come home. She’d been away for two weeks to stay with her awful friend Sheila in France – two glorious mum-free weeks that had shot by all too fast. Two weeks without amateur dramatics every five seconds over pathetically trivial things, two weeks without running out of milk or teabags or toilet roll or some other basic household item every day, two weeks without having to avoid the latest person mum had managed to mortally offend, two weeks without her bringing home some geeky guy to patronise me and Orly. Instead we’d had two weeks of normal family life at our gran’s with scrummy meals, two weeks of fun and laughter, two weeks of me not having to be mother to Orly, two weeks of being a typical sixteen-year-old. It had been brilliant. But now it was over. We heard her car crunch its way up the gravel drive to the doorway. “Mummy, mummy!” yelled Orly, leaping up from the table. His pudding went flying across the room. That sort of thing was perfectly normal with Orly. He’s nine and amazingly clumsy. He has mild learning disabilities. I love him to bits. He’s more my kid than mum’s since I’ve been the constant in his life. Dads have come and gone, and poor Granny Paradise gets banished regularly by mum so she’s not always around. I’ve pretty much brought him up, and I have to say I’ve done a good job. He’s a super kid. His only drawback is that he adores Mum. “Well, at least someone is glad to see your mother back,” remarked Granny Paradise drily. I sighed. Granny Paradise shot me a sympathetic look. “Go on, you’d better go and greet her,” she said, standing up to clear up Orly’s mess. “OK,” I shrugged reluctantly. Actually, I was overdoing it a bit. Mum drives me demented, but you have to admit that life is certainly not dull when she’s around. It would be kind of nice to see her again. For five minutes anyway. After that, I’d be fed up with her again. Orly was dancing around Mum when I got to the door of Granny Paradise’s house. “Where’s my present, where’s my present?” he was chanting. Mum laughed and ruffled his hair. She looked fabulous. She’d picked up a beautiful suntan while she’d been away. She’d also got some new clothes by the looks of it – a skin tight pair of crop jeans, and a skimpy, lacy top. They were gorgeous. I was green with envy. Mum tottered towards the house in one of her hallmark pairs of ludicrously high stiletto-heeled sandals. She had a bulky shoulder bag covered with rhinestones. Bars of chocolate and a couple of bottles of perfume stuck out of it. “Hi Mum!” I managed a smile. “Hi love.” She planted a kiss on my cheek. Orly barged past me, following her into the hall. Mum teetered into the kitchen and plonked herself down on a chair, her bag beside her. Orly jumped on her lap. “You did get me a present, didn’t you?” He was getting worried now. Well, that was dumb, even for Mum. How was Orly supposed to get it then? “Don’t worry sweetie. We’ll go and get it very soon,” she told Orly. Orly frowned. He didn’t want to have to wait that long. I frowned too. I was more concerned about this going to France thing. Term started in ten days’ time. I was really looking forward to sixth-form college, even though I wasn’t even vaguely prepared. We hadn’t got round to going into town yet to buy the textbooks and stationery I needed. “What’s going on, Mum?” I asked. I stared her at in horror. Granny Paradise dropped the piping-hot dish of beef casserole she’d just got out of the oven. “I’ve bought a darling little cottage for us,” Mum beamed. “What with?” was my hypersonic question. We were permanently broke. First I’d heard about that. “So what is my pressie?” demanded Orly petulantly. “But, but …” There were about a million things I needed to ask Mum, but I just couldn’t get the words out. I couldn’t even get up to help Granny Paradise clean our tea up off the floor. Mum had excelled herself this time. Granny Paradise hurled the casserole and food into the bin and stormed out. If only I could have regained the power of movement, I’d have followed her. Mum sighed melodramatically and rolled her eyes. “Just the reaction I thought I’d get. But aren’t you excited?” She looked at me expectantly. “You’re overwhelmed,” interpreted Mum, looking pleased with herself. ”It’s such an opportunity for you. I know you’ll thank me one day. Now, I must go and tell everyone the news.” She headed for the phone. I stared after her, so furious I could have exploded. Opportunity? Thank her? No flipping way! But overwhelmed? Darn skippy I was overwhelmed. So frigging overwhelmed, I could do some serious damage to my mother right now. Orly brought me back to earth. “Brownie, I don’t understand. Has Mummy got me a pressie or not?” he pouted. Orly was quite happy with that explanation and ripped open the bar. He broke it clumsily into halves and gave one to me. He’s such a generous kid. “I’ll give Granny the other bar,” he announced, through a mouthful of chocolate. “That’s my kind boy,” I tried to smile. “Don’t you want your choccie?” Orly asked, watching me as I just sat looking at it. Normally I am the world’s greatest pig where chocolate is concerned. I trotted outside into the garden and soon saw Granny Paradise in the greenhouse, aggressively watering the tomatoes and talking to herself angrily. I slowed down. It was probably best to leave her to cool down, at least emotionally. The greenhouse was only going to make her redder in the face. I did not want to see Mum. I was so furious with her. Yet again she was mucking up our lives. She was so good at that. Oh for the calming influence of a sensible dad. It’s time to talk about my dads. I’ve had a good few. Dad One was my biological dad, but I never knew him, and the only thing Mum ever told me about him was that his name was Paolo and he was Portuguese, or possibly Spanish, but definitely southern European. 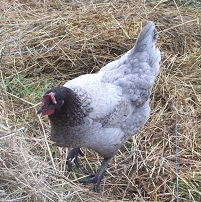 I have his colouring and dark brown eyes. He was mum’s boyfriend for just a few weeks, but that was long enough. Apparently he took off at the speed of light when he found out Mum was pregnant with me. Enter Dad Two when I was three. He’s Orly’s dad and he’s brilliant. His name is Winston Jackson and he’s in the U S Navy. He’s from the Bahamas. Granny Paradise is his mum. Dad Two met Mum while he was on shore leave from his ship. He fell in love with her and married her as soon as he could and set up home here in the UK. He was away for a lot of the time with his job. Orly arrived when I was six. Granny P left her sunny home and came to live nearby. Poor Granny Paradise, she hates this country. She’s always cold and never wears fewer than three cardigans, even in summer. Anyway, Dad Two was a really good influence on Mum, for a few years at least. But she got fed up being a sailor’s wife and dumped him. She ran off with Dad Three, a complete and utter loser from day one. He spent what little money we had and then deserted us. Granny Paradise amazingly took us in for a year or so while Mum vaguely pulled herself together and got a job. Then along came Dad Four. He was fun. He was a computer programmer, I think. Mum thought that meant he was rich, but he wasn’t. Just really nice. I have loads of brilliant memories of our time with him. But, usual thing, Mum got bored and divorced again. She left Orly and me with Granny Paradise for about eighteen months this time and travelled round the world, trying to find herself. She found Dad Five instead, in Denmark. So we went out there, but Mum hated all the snow so back to Granny P’s we trailed, without Dad Five. Since then, thank Heavens, Mum hasn’t had a long-term relationship. She hasn’t had a long-term job either, but she’s worked enough for us to get by. There’s just been a string of very temporary boyfriends. We’ve moved in with a few of them, and some have moved in with us. All in all, it’s been a crazy life so far. I’d hoped that perhaps Mum had finally settled down. We’ve been living in the same tiny rented flat for just over a year now, which I think is a record. But now, evidently, we were off again. No, hang on. What about French? I wasn’t very good at it. Actually, I wasn’t very good at anything, apart from maths. I’d been to that many schools, there were whole chunks of the curriculum I’d never come across, whereas others I’d done half a dozen times at different schools. I’d only just scraped through half my exams this summer. I’d been lucky to get into the sixth form college I really wanted to go to. My mates were going there. It had looked like being a good time, but not any more. What was I going to be doing school-wise? Crikey, that was a scary thought. Why did Mum have to do these things to us? Granny Paradise came out of the greenhouse, still muttering but looking a bit calmer. I sidled up. We looked at each other. We didn’t need to say anything. Mum strikes again. I slipped my hand into hers and gave it a squeeze. She squeezed it back. “Oh child,” she sighed heavily. I knew what she was thinking. She’d left her lovely warm home in the Bahamas to be with her son and then her grandson. She was devoted to Orly, so even after Dad had gone back to the States, she’d stayed in cold old Ireland. She’d helped Orly up and also taken me under her wing, even though I was no relation to her at all, and she’d stuck with us through thick and thin. And now Mum was taking us all away to another country, far from her. Dragging us off into all sorts of mess and muddle, if things went according to usual. Who knew how often Granny P would be able to see us? Mum was so selfish and uncaring. We were back at the house by now. I kissed Granny P on the cheek and headed off to find Mum. She was making herself a cup of tea, or rather a cup of sugar with a bit of tea mixed in. She had an extremely sweet tooth. I rolled my eyes. The top was fine. Mum was simply being nasty. Oh, for goodness sake! Mum never did anything for anyone else. She was doing this for her. She could just have put the money into the bank for me and O, not buy some undoubtedly crappy dump in a foreign country. 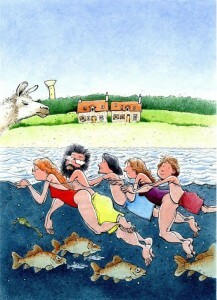 It was hardly a watertight investment. I was sad to hear about Dad Four. He’d been a good guy. I’d have to grieve for him later though. There was too much to find out now. “When do we go?” I demanded. “But what about our education? I’ve got my place at college and Orly is so happy at his special school. Can’t you just think about us for once?” But I knew that was a rhetorical question. “And whose fault is that? Dragged from one school to another, never helped at home cos you’re never there – I haven’t had much chance to be the next Einstein, have I?” I was right and she knew it. I stomped off. We were going to hell in a handbasket and I couldn’t do anything about it. But in 379 days I would be 18 and I would leave home. Probably at one second past midnight. I had it all planned out. I would get a job, anything would do, find somewhere to rent and then Orly could come and live with me. And if I should happen to get a really well paid job, I’d buy a holiday in the tropics for Granny Paradise to warm her up. And a motorbike for me. You see, all planned out. So Mum had really messed things up. As she always did. So, Waterstones is to launch its own ereader as a rival to Kindle and Nook. The MD of Waterstones, James Daunt, said he was inspired by the Nook, but he must also have had in mind the fact that Amazon sells more Kindle books than print ones these days. Waterstones is ambitious. It’s a huge undertaking to come up with a piece of ereading hardware to seriously contend with the ones already out there. Which will it be most like? 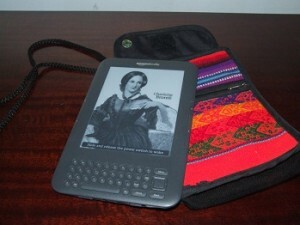 Touch screen and back-lit like Nook, or fantastic e-ink technology but fiddly little buttons to press like the Kindle. If it takes the best features of each, then it will be quite an awesome machine. And there’s not that long to wait. The device will be launching in Spring 2012, if all goes to plan. I’ll be very interested to see what arrives on the scene. If you don’t like the thought of paying VAT on your ebook then sign this petition. if you’re either UK resident or a UK citizen living elsewhere. Dead tree books don’t have VAT charged on them, so it seems extremely unfair and inconsistent that electronic ones do. Apparently they’re a luxury, whereas paper books aren’t. Now the EU is OK about member states charging a reduced VAT rate on “any similar physical medium that predominantly reproduce the same textual information content as printed books”, and has been since January 2011. Spain has taken advantage of this to reduce its VAT on ebooks to 4%. Elsewhere though, a different story. In Italy VAT is 4% on paper books and 20% on ebooks, and in Germany the figures are 7% and 19% respectively. France shoves 19.6% TVA (= VAT) on livres electroniques. There’s a petition here to sign too to try and get this put to rights, so if you’re a resident in France, then please do sign this one too. However, the economic climate in Europe isn’t one that’s likely to make governments look favourably at reducing their tax income in any shape or form at the moment. But, we can at least try.